Harman Kardon has fired the first salvo in what is unlikely to be the last of a series of headphone assaults on the mainstream. 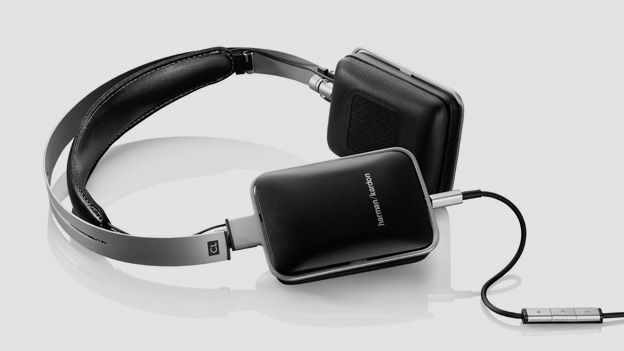 The high-end audio brand obviously feels that it's time to snap up some of that Beats market, and these Harman Kardon CL on-ear headphones are aimed squarely at that segment, along with the B&W P3s and Philips Fidelio L1s. Shy and retiring this design ain't – where competitor models have gone all sleek and sultry, HK has stepped in with some 80s-style monster cans. We were told at launch that the earpieces have been designed to reflect the original iPod's shape, and as that's a decade-old design classic, the retro look is unavoidable. For your £160 you get a pair of head bows in small and large, which are relatively easily swapped, albeit disconcertingly by twisting the earpieces around on their uber-industrial swivels. First impressions are of a quality product, but sharp metal edges feel unfinished, and the plastic backing to the earpieces will not only scratch, but feels a bit budget in places. In the high-quality card box you'll also uncover the carry case, an A5-sized imitation leatherette padded bag. A mixed bag here – the main elements are crafted from matt finish steel, and the swivels are clearly designed to take a beating. A removable cable takes the pressure off the fragile headphone/cable join, which is often where cables fail. These are supremely comfortable cans – the spring-loaded headband allows them to be shifted around and positioned exactly where you want them. The earpads are lined with memory foam and conform to your head comfortably, while the swivels allow those pads to sit flush with your head. In short, they're pretty anatomical, for all the semi-industrial design. Good news - HK's undeniable audio pedigree shines through, and these custom 40mm drivers deliver in spades. An impressive- on-paper 16-20,000 frequency response and a ported cabinet that recycles audio info from the rear of the headphone like a high-end speaker work brilliantly to present a clear acoustic vision. Bass and midrange are luxurious without being overwhelming, and the overall picture is one of balance and precision. Even low-quality MP3 audio sources on a mobile phone sounded refined and clear, while using a 'proper' audio source was a real pleasure. As these are aimed squarely at the iPhone market (originally launching as an Apple store exclusive), this audio alchemy ability is a vital one, and Harman Kardon has done the job. The audio is absolutely brilliant, the comfort is high, and although the price is relatively salty, these are quality audio tools. That said, the styling will polarise buyers, and the finish detailing might not measure up to everyones expectation of a premium product. The budget leatherette case brings the overall tone down, and belies the quality of the overall package, but there's simply no arguing with the sonics.